Are you tired and sick of that old home space that fails to provide you something new? If yes, then start a new journey with ‘Emaar Palm Premier’ that is highly maintained and well conceptualized home space where life is truly astonishing. Experience the amazing living at Palm Premier – a lively and cheerful neighborhood offering a picturesque view of Aravali Hills and enclosed with resuscitating verdant spaces. It is an extensive residential township devised with only 2 apartments on each floor and equipped with lavish greens, high-speed elevators and uninterrupted power. Palm Premier is a new residential project that provides a new level of comfort and luxury that will always make you smile. Spread across vast acres of land, this majestic project contains mid-height and stylish twin towers that are really divine. Offering 3BHK apartments with lounge and Utility with a size of 2000 sq. ft., you will find the perfect abode that you have always dreamed of. You will find homes that are simply gorgeous and spacious, and comes with laminated wooden flooring in all bedrooms, marble tile flooring in dining and living, elegant modular kitchen with chimney, geyser and hob, split AC in dining, living and all bedrooms, shower cubicle in master bathroom, exclusive fittings and furnishings, large doors and windows offering gorgeous views, hi-tech safety features and more. With top-notch internal amenities, the project leaves zero room for errors. The development is second to none in terms of external amenities. It promises a healthy and active lifestyle with modern clubhouse equipped with gymnasium, sports and healthcare facilities that will always inspire you to get moving. Located in Sector 77 Gurgaon, this Emaar New Project Sector 77 ensures a bubbly and superb lifestyle with top-notch amenities such as swimming pool, cafeteria and crèche, shopping complex, business center and multipurpose hall, jogging and walking tracks and various indoor and outdoor facilities and courts. A dedicated play area for kids is another attraction that will let your children to play and enjoy freely. Apart from these stellar amenities, stringent security, meditation area, piped gas supply and fire fighting equipments and a lot more amenities are also available here. Wide open space and lush green landscaped gardens also add charm to this architectural marvel. Smartly situated at Sector 77 in Gurgaon on India’s most strategic corridor Delhi-Mumbai Expressway, Emaar Palm Premier Sector 77 enjoys smooth connectivity to all the major places in and around the city including IGI Airport, Delhi Border, IT Hubs and more. Edged by the NH-8 and with easy connectivity to Dwarka Expressway and Southern Peripheral Road, no place in Delhi NCR is too far from here. Besides, several renowned schools, colleges, hospitals, banks, entertainment zones, transport facilities, supermarkets, malls, convenience stores and more also lie in close proximity to the project site, making it one of the most desirable destinations in Delhi NCR. Starting at just Rs. 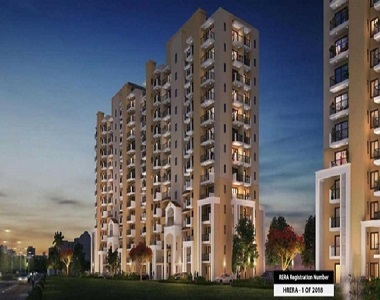 99 lakhs, Emaar Palm Premier Price is quite attractive and affordable and is backed by a number of multiple payment plans and other offers for a convenient purchase. So, rush and book a sophisticated home in Palm Premier and enjoy the best of both words – wide green spaces and contemporary urban lifestyle.